For Magic: The Gathering players, Eric Deschamps’ artwork has become ubiquitous with some very powerful cards over the past few Standard rotations. From the hasty red punisher Ash Zealot to vampire legend Olivia Voldaren to current powerhouses like Elspeth, Sun’s Champion and Courser of Kruphix, Eric’s evocative artwork has transported players to Innistrad, Ravnica, Theros and beyond. On Friday, Nov. 7, Eric made yet another epic contribution to MtG lore when his artwork for the new white planeswalker, Nahiri, the Litomancer, was released as part of the Commander 2014 decks. Nahiri and her fellow mono-colored planeswalkers mark the first time that planeswalker cards can be officially used as one’s commander. To celebrate the release of Eric’s artwork in Commander 2014, Art of MtG spoke to the Gardiner, N.Y.-based illustrator via email about his collaborations with Wizards of the Coast. Art of MtG: You’ve been doing work for Wizards of the Coast for more than 10 years now, having illustrated more than 80 cards. Tell us a little bit about how you got started. Eric Deschamps: An artist friend of mine introduced me to a few art directors through email. I sent a few art samples out to them but didn’t receive work from those email exchanges. Eventually, I met one of the art directors in person at a portfolio review at San Diego Comic-Con. This was Jeremy Cranford, the Magic art director at the time. After that face-to-face meeting, I received my first-ever paid project illustrating two cards for Unhinged. Magic the Gathering gave me my first illustration commission as a professional! Art of MtG: What was the first artwork you did? Eric: My first piece of art was the Magic card Goblin S.W.A.T. Team. It depicted a handful of goblins parading around with huge flyswatters. Since the card was a humorous image, it really took a lot of the stress out of my first commission ever. 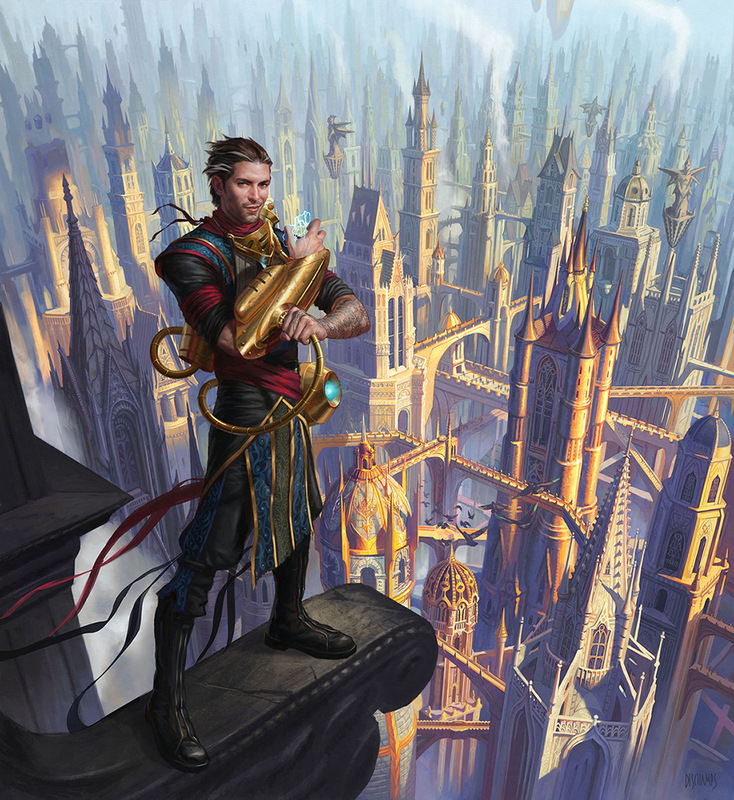 Art of MtG: Moving forward in time, we’re now seeing and getting to play with the newest cards from the Commander 2014 set. 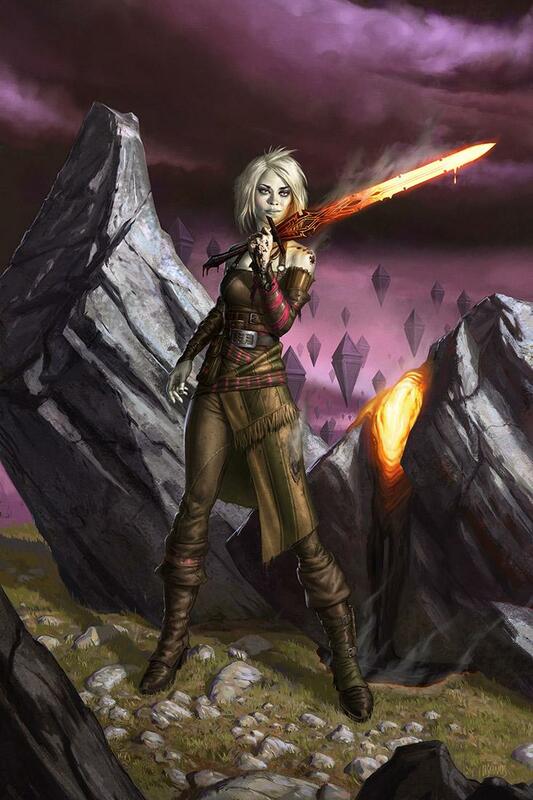 You did the artwork for the new white planeswalker, Nahiri, the Lithomancer. Can you tell us a little bit about how this particular piece came about? 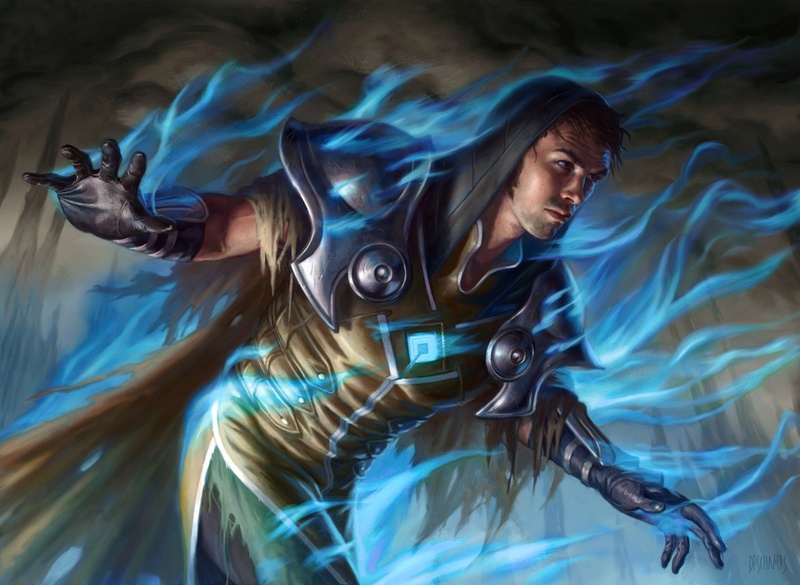 Eric: It’s always exciting to see a planeswalker commission come into my inbox. Zendikar was my favorite Magic: The Gathering block, so working on a planeswalker that had some Zendikar flair to her added to the excitement. My initial sketches had a little more focus on Nahiri creating the sword, while the final art you see shows the moment right after the Lithomancer pulls the sword from the stone. After seeing my first sketches, the Magic team felt that Nahiri should be engaging the viewer more. I submitted a new sketch with Nahiri holding up her new creation for the world to see. This did the trick, and I was given the go ahead to finish painting Nahiri, the Lithomancer. 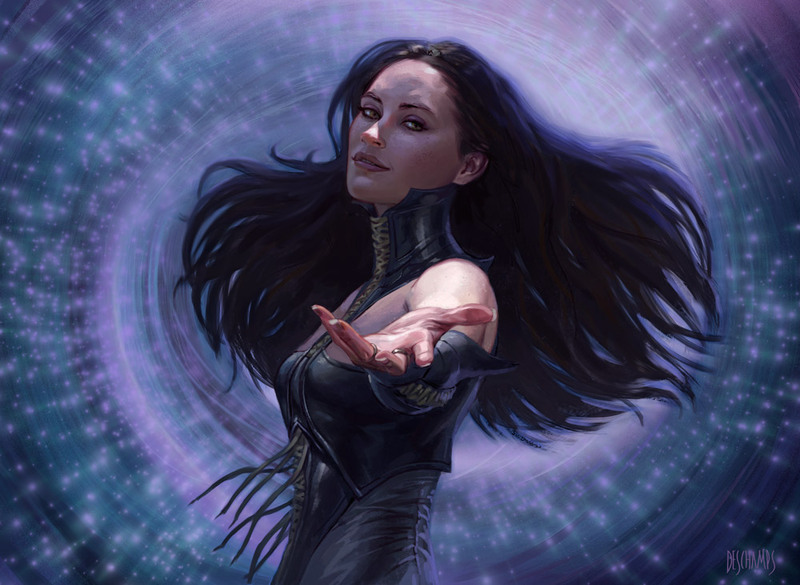 Art of MtG: Women seem to play a big part in your Magic artwork. There’s Elspeth, Ash Zealot, even Bogbrew Witch. It that a coincidence? Eric: I’m not sure. My natural inclination is to make strong female characters, not over-sexed women or damsels in distress. I think that is right in line with what the team at Magic is trying to do. Which is probably why I get a lot of female commissions. 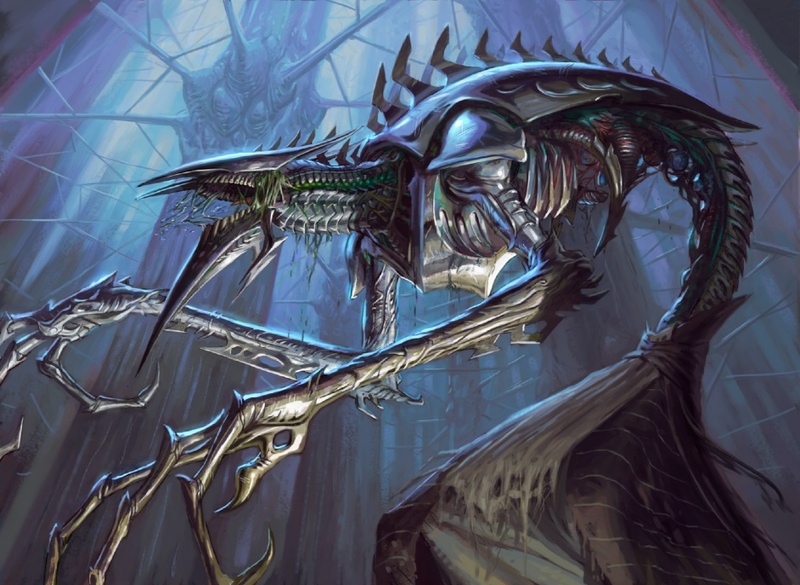 Art of MtG: Overall, what’s your favorite creature type that you like to illustrate for Magic? Are there any creatures, like minotaurs, that you haven’t had a chance to illustrate yet but really want to? Eric: Honestly, I like to get a variety to work on, so there isn’t one creature type that I would take no matter what. For a while, I was really into merfolk. When I was a part of the concept team for Theros, I jumped at the chance to design a few tritons. I think I’d like to do a griffon. Actually, I’d really like to paint Nicol Bolas. 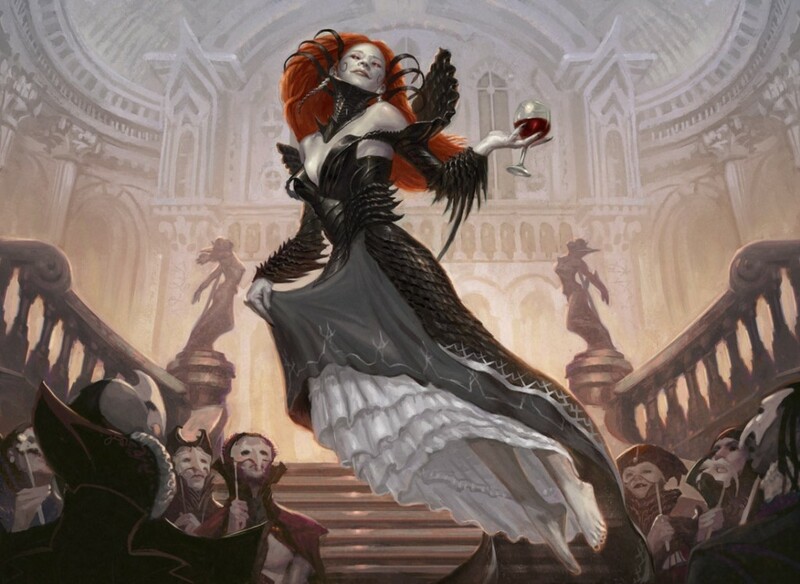 Art of MtG: What’s your favorite piece that you’ve done for Wizards of the Coast? My favorite is the one I just completed yesterday. Of course, I can’t tell you anything about it! As far as released images go, I would say my two favorites are the Dragon’s Maze key art (the daylight shot of Ral Zarek overlooking Ravnica) and Venser, the Sojourner from Scars of Mirrodin. Venser was my first really important character to paint, and I put a ton of work into that piece. The Dragon’s Maze image was a huge undertaking. I really had a feeling of accomplishment after painting the huge overhead city shot. Art of MtG: Finally, how can people learn more about you and even buy some of your great artwork? My website is ericdeschamps.com. There’s a link to my blog, videos of my work in progress, and almost all of the images on the site have an “add to cart” feature at the bottom of the window if anyone would like a print or artist proof. Good job Pat . It was an interesting read!